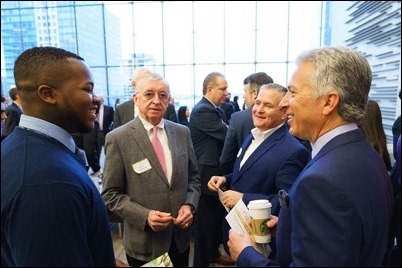 Friday morning, I went to the offices of PwC in the seaport to attend the annual Celebration of Excellence Breakfast sponsored by the Catholic Schools Foundation. We are very grateful to Mr. John Farina for hosting us in that spectacular venue. 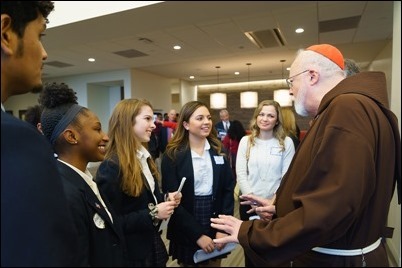 The gathering brought together Catholic Schools Foundation supporters and seniors from 22 Catholic high schools across the archdiocese who are recipients of CSF scholarships. It was very encouraging to see how many fine young people have benefited from those scholarships. I was also very pleased to see that a number of young people there had also been with me in Washington at the March for Life in January or in Panama for World Youth Day. 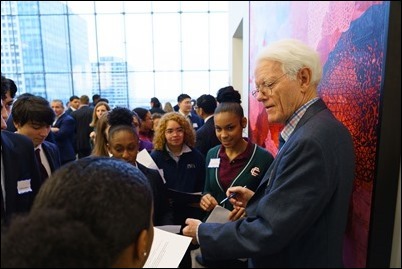 There was a speaking program during which John Farina encouraged the young people to pursue their passion in life as they continue on with their education and careers. We also heard from one of the seniors as well as a graduate who spoke about the difference that attending a Catholic school made in their lives. 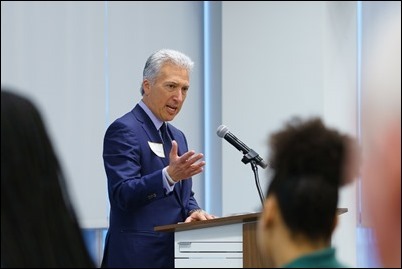 I also offered some remarks, in which I spoke on the importance of Catholic education, congratulated the students on their achievements and thanked all the benefactors of the Catholic Schools Foundation. Each year around this time we hold a discernment weekend retreat for men considering a vocation to the priesthood. It is an opportunity for them to visit our seminaries and learn more about seminary life. 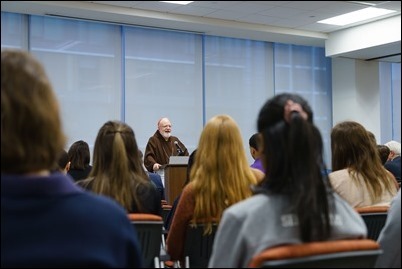 Typically, the retreat is held with two tracks: one for older men, who would be candidates for Pope St. John XXIII Seminary and another for younger men who would be candidates for St. John’s Seminary. So, on Friday afternoon I joined with the older group at Pope St. John Seminary. There were about half a dozen men at that retreat. 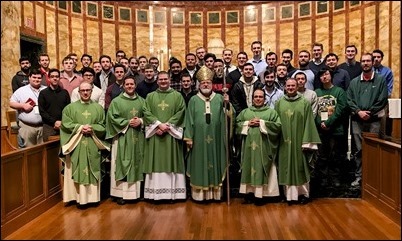 Then, as they continued their retreat, in the evening I went on to join the other group of about 45 men who were meeting at the Fatima Shrine in Holliston. I remained with them all day Saturday and preached the retreat for them. It was a very full schedule, which also included opportunities for them to hear the witnesses of our seminarians, pray together and meet some of seminarians and priests of the archdiocese. Sunday morning, the retreat concluded with a Mass at St. John’s Seminary in Brighton. After the Mass, we posed for this group photo together. I told the retreatants that if any of them had not yet informed their girlfriends that they were coming on this retreat, we could Photoshop mustaches and dark glasses on them! 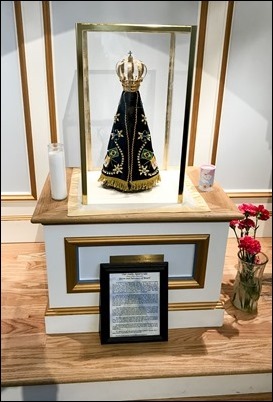 Then, Sunday afternoon I met with Bishop Calogero Peri, OFM Cap., who was here, along with one of his priests and seminarians, to bring the relics of St. Agrippina of Mineo for the festival in the North End. Father Antonio Nardoianni of St. Leonard’s brought them to greet me. There are many people from that part of Sicily who are associated with the feast in the North End, and so it was an opportunity for me to thank them for bringing the relic to Boston. Monday, was the funeral of Father Paul Bailey at St. Mary Parish in Plymouth. Father Roger Landry, who grew up in Lowell when Father Bailey was the pastor at St. Michael’s, preached the homily. It was a wonderful homily in which he stressed the theme of Father Bailey’s great intellectual capacity. He said he was a man who was very much devoted to study and reflection, and he spoke of how that enriched his ability to teach and preach. 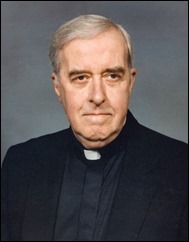 Father Roger also underscored Father Bailey’s great kindness, particularly toward those who were experiencing economic or social needs. He said he had a great sense of social justice and mercy, which involved him deeply in people’s lives. While I was at St. Mary’s, I took this photo of the statue of Our Lady of Aparecida in the church. The Brazilian community there has done a lot to help in the renovations of the church and they have this statue of the Patroness of Brazil there. 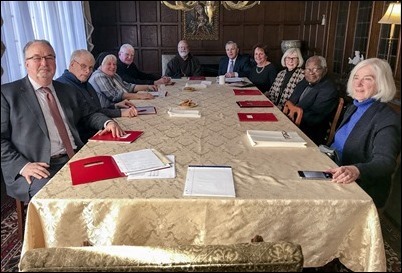 Monday afternoon, we had a meeting of the board of the Pontifical Mission Societies of the Archdiocese of Boston. It was so good to be together with our director, Father Gabe Troy as well as Maureen Heil and all the other members of the board. It is always very encouraging to see their dedication, not to only raising money for the missions, but perhaps even more importantly, to raising missionary awareness. 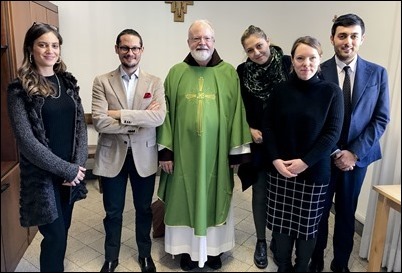 For example, we spent a great deal of time discussing the work of the Missionary Childhood Association, which seeks to engage young people in the missionary work of the Church at a young age and, hopefully, lead them to develop an awareness and care for the missions that will continue throughout their lives. Boston has a very long tradition of supporting the work of the Pontifical Mission Societies, particularly since the time of Cardinal Richard Cushing, who was himself director of the Office of the Propagation of the Faith in the archdiocese and the founder of the St. James Society. I am grateful to the board members and staff of the Pontifical Mission Societies who dedicate themselves to continuing that tradition. Tuesday, I arrived in Rome for a series of meetings regarding the work of the Council of Cardinals advising the Holy Father, as well as to participate in the meeting of the Holy Father with the presidents of bishops’ conferences from throughout the world on clergy abuse. Wednesday, I had a Mass with some of the staff of the Pontifical Commission for the Protection of Minors. 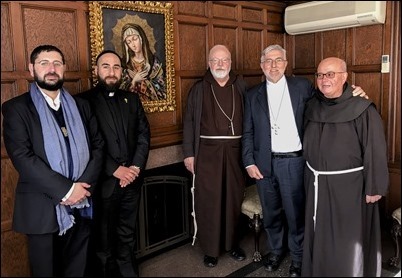 We are very grateful for the generous service of the people working in the office and for all they do to promote safeguarding throughout the world. The Past: The clergy abuse crisis exploded in the United States early in 2002 when the unprecedented dimensions of the crisis became clear, leading the U.S. Bishops Conference to adopt “The Dallas Charter” later that year. The Charter promised a policy of zero-tolerance of sexual abuse of minors, meaning that accused priests determined to have abused a minor would be removed from ministry; all cases would be referred to appropriate civil authorities and each case would then be investigated within the Church. Beyond the provisions in the Charter, individual dioceses have adopted policies to provide care and counseling for survivors and education and prevention training in our parishes, schools and religious education programs. Reviewing the past, we acknowledge the record includes gaps and failures as well as successful implementation of these policies. At the same time, the Church in the rest of the world has experienced the abuse crisis in different ways at different times. The Present: In 2018, the primary attention of responsibility for the abuse crisis shifted from priests to bishops. It became clear that the Dallas Charter, focused on priests, needed to be amended to include accountability for bishops and cardinals. In order to broaden the policy in this way, the U.S. Bishops have proposed that a publicly announced method of reporting cardinals and bishops implicated in occurrences of sexual abuse be established. We also have advocated for the establishment of an oversight review committee that includes appropriately credentialed professional lay leadership. However, the Holy See asked the U.S. Bishops Conference to postpone action on this proposal until after the meeting in Rome. The Future: As always, first and foremost in our thoughts are the survivors of abuse for whom we continue to pledge our vigilance. We use this occasion to pledge our continued commitment to the policies we have adopted and to all those measures of care, counseling, education, and healing needed to abolish the scourge of sexual abuse throughout the Church.